ABS brakes, Compass, Electronic Stability Control, Emergency communication system, Heated door mirrors, Heated Power-Adjustable Black Outside Mirrors, Illuminated entry, Low tire pressure warning, Power Door Locks w/Remote Keyless Entry, Remote keyless entry, Traction control. 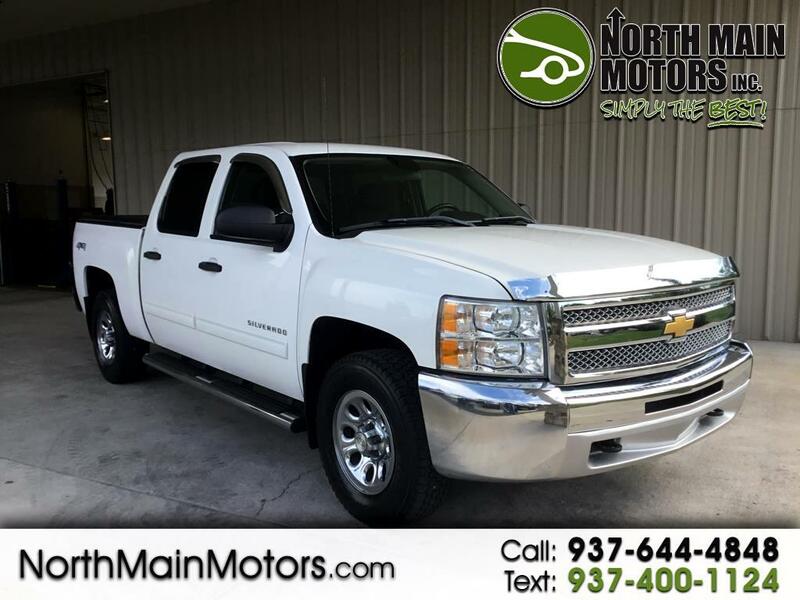 North Main Motors is proud to offer this wonderful 2012 Chevrolet Silverado 1500 LT In Summit White. This vehicle is beautifully equipped with Heavy-Duty Handling/Trailering Suspension Package, ABS brakes, Compass, Electronic Stability Control, Emergency communication system, Heated door mirrors, Heated Power-Adjustable Black Outside Mirrors, Illuminated entry, Low tire pressure warning, Power Door Locks w/Remote Keyless Entry, Remote keyless entry, Traction control, 17" x 7.5" 6-Lug Chrome-Styled Steel Wheels, 3.42 Rear Axle Ratio, 6 Speaker Audio System Feature, 6 Speakers, Air Conditioning, AM/FM radio: SiriusXM, AM/FM Stereo w/MP3 Compatible CD Player, Body-Colored Bodyside Moldings, Bodyside moldings, Bumpers: chrome, CD player, Chrome Grille Surround, Color-Keyed Carpeting w/Rubberized Vinyl Floormats, Delay-off headlights, Driver & Front Passenger Illuminated Visor Mirrors, Driver door bin, Driver vanity mirror, Driver-Side Manual Lumbar Control Seat Adjuster, Dual front impact airbags, Dual front side impact airbags, Electronic Autotrac Transfer Case, Front 40/20/40 Split-Bench Seat, Front anti-roll bar, Front Center Armrest w/Storage, Front reading lights, Front wheel independent suspension, Fully automatic headlights, Leather-Wrapped Steering Wheel, MP3 decoder, Occupant sensing airbag, Outside temperature display, Overhead airbag, Overhead console, Panic alarm, Passenger door bin, Passenger vanity mirror, Power door mirrors, Power steering, Power windows, Power Windows w/Driver Express-Down, Premium Cloth Seat Trim, Radio data system, Rear reading lights, Rear seat center armrest, Rear step bumper, Remote Keyless Entry w/2 Transmitters, Security system, SIRIUSXM Satellite Radio, Solar-Ray Deep-Tinted Glass, Speed control, Split folding rear seat, Tachometer, Tilt steering wheel, Variably intermittent wipers, and Voltmeter! Reviews: * With its numerous possible configurations, the 2012 Chevy Silverado half-ton pickup will please all but the chronically indecisive. From cab configurations to bed lengths to trim and option packages, the Silverado is the half-ton jack of all trades, including models that can run on E85. Source: KBB.com * Smooth and quiet ride; comfortable seats; powerful V8 options. Source: Edmunds From the moment you step on our lot until the time you drive away in your next car, your buying experience with North Main Motors is our number one priority. We encourage you to use the expertise and resources of our sales staff - they are here to help you find the right car at the right price. Call us today at 937-644-4848 to schedule your test drive!